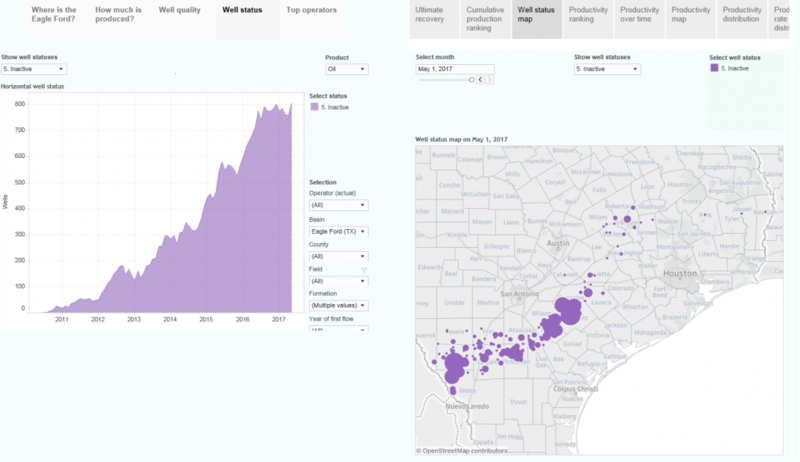 This interactive presentation contains the latest oil & gas production data from 19010 horizontal wells in the Eagle Ford region (TRRC districts 1-4), that started producing since 2010, through May 2017. Now that I have access to far more well and production data in Texas, the results shown here are more complete and accurate than before. Where in the past I used typical decline curves to solve the “lease allocation” puzzle (production in Texas is reported by lease, not by well), now several types of individual well data points are included in this algorithm to accurately determine the production history for individual wells. For example, regular well tests, which measure actual oil, gas, and water production, are now used as the main key, but also known shut-ins, and oil proration data. I plan to show this “lease allocation” process in more detail in a separate post, in the coming 2 weeks. Especially for the Permian, where there are several leases with hundreds of wells, I expect results to be quite a bit better and complete. Also more detailed formation data is available now, and water production has been estimated from the fore-mentioned well tests. In most overviews in this post, I have selected the “Eagle Ford” and “Austin Chalk” formations (to exclude certain conventional horizontal wells), so beware of this when you want to include other formations as well. Ignoring the rather incomplete data for April and May, oil production in this region has stabilized at a level of about 1.1 million barrels of oil per day, while gas production is still modestly falling. The trends of longer laterals, and more proppant per lateral feet, are still continuing in 2017. So far this year, lateral lengths in this region are about 7k feet, compared with just over 6k feet in 2014. The total proppant mass per completion rose to almost 12 million pounds in 2017, on average, versus 7 million in 2014. As usual, the “Well quality” tab shows how these factors have led to changes in the production profiles of these horizontal wells. In 2017, wells peak at a rate greater than 600 bo/d, before starting a similar decline profile as earlier wells. In this “Ultimate Recovery” overview we can see that new wells recover about 80 kbo in the first 6 months on production, which is close to double the amount that wells starting in 2012 did. However, it doesn’t appear that the ultimate recovery will also be a factor 2 larger. In the 2nd overview (“Cumulative production ranking”), all these horizontal wells are ranked according to their cumulative production. As individual well production is estimated more accurately now, I belief that the accuracy of this ranking has also risen. It appears that 3 horizontal wells, that started production since 2010, have now done more than 800 kbo cumulatively. The “Productivity distribution” overview is handy if you’re interested to know the % of wells that reach at least a certain amount of production, within a specified time frame. For example, using the black curve, you’ll see that of all these wells that have produced at least 2 years, just over 10% has done more than 200 kbo. You’ll get this number by subtracting the running total in the tooltip (89.63%) from 100%, at the 200 kbo mark. Of course you can use the selection boxes to narrow down the population of wells that you wish to look at. On Thursday I plan to publish a new post on the Permian, followed by an update on North Dakota. I would like to warmly express my gratitude to Mike Shellman, who again did not spare any expense in supporting me with knowledge on the procedures of the Texas RRC. In the coming month I still plan to make a few smaller improvements to the Texas data. For example, I want to include pending production, and also estimate the production from wells that do not have a single well test reported yet. These improvements are only relevant for about 1% of the wells. Texas RRC. Now individual well production data is accurately estimated from a range of data sources, including regular well tests that measure actual well production (oil, gas & water). I’ve observed your work over the years with keen interest. I have watched how analysts that don’t “like” the realized production data you present try and blow holes in it, as though because that data did not jive with shale company investor presentations, EUR’s and economic projections, somehow the data was wrong… that it was not the truth. But it IS the truth. No regulatory authority in any state in America can, within statutory law, create imaginary barrels or mcf’s to report to the public. You keep breaking new ground and finding better ways to deliver the truth. Thank you. I am proud of you. Its been my honor to help any small way I can. Your support in figuring out all the detailed rules that operators have to follow in Texas has allowed me to come this far. And the journey hasn’t ended yet, there is far more interesting data to reveal. Is there a way to see or determine how many horizontal wells in the EF are inactive producers in a calendar year, say for 2011? Can this be filtered by operator? I’m interested in what the potential plugging and abandonment liabilities certain operators may be looking at in the future. This may be impossible to determine if a leases has several wells and one or more are still producing. Also, this is a question for Mike. Is there an obligation to report pending or deferred plugging and abandonment liabilities on a pubco’s 10ks if the amount affects a balance sheet? I can answer that – yes, companies do have to publish this information. It’s typically included within Property, Plant and Equipment as an “Asset Retirement Obligation” and the detail will be given separately in the notes to the financial statements. The costs must also be included in the PV10 calculations. > Is there a way to see or determine how many horizontal wells in the EF are inactive producers in a calendar year, say for 2011? Can this be filtered by operator? 1. In the first presentation, go to the “Well status” tab. Select well status “Inactive”. I call a well “inactive” if there is no oil or gas production in a month, but it is also not yet plugged, according to the latest information. As usual, you can use the other filters to zoom in to specific operators/formations/counties. 2. In the 2nd presentation, go to the “Well status map”. Also here select the status “inactive”. Now you’ll see the location of all these inactive wells, in the latest month available (May 2017, although you can use the slider to change this month). See below a sample of how these look like. I can now accurately determine whether a well is producing or not (even if it is on a lease with multiple wells). The reason is that there are several sources that make that clear on individual well level: there is an inactive well list, and the oil proration data also reveals this. John, to the best of my knowledge, Mr. Wheel has answered your question with regards to plugging and decommissioning costs. Whether the actual physical cash for plugging and decommissioning is actually set aside, I do not know and would be suspect of that. I might add, from an operations standpoint, that those decommissioning costs are no small matter and, in my opinion, have a negative affect on the market value of what I assume will ultimately be 19,000 ft. TMD HZ, marginal stripper wells. Some of the leasehold provisions I have seen regarding restoring land to its original state are very operator onerous; every bucket of limestone pad material must be removed, for instance. A lot of the surface equipment involved in shale operations one might think would have ‘salvage’ value is subject to NORM standards and will be very expensive to dispose of. There are a number of wells being plugged in the Eagle Ford already where some amount of production casing is being recovered, that one might also assume would also have “salvage’ value, but is in fact being sold for scrap iron. I believe these shale wells ultimately pose a big liability to operators, additional liability over and above massive amounts of long term debt that was required to drill and complete the well in the first place.